come to the classroom with extensive, real-world experience. All our Our facilitators have international teaching experience. They guide the learning of each child from dependence to interdependence with deep knowledge and understanding of their subjects and the curricula offered. 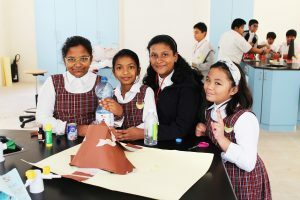 Teachers foster integral connections with curriculum and develop programmes based on student interests and inquiries. The backbone of teacher’s support system is our on-going professional development programme. Our student-teacher ratio allows closer interactions between students and faculty, and simultaneously creates a lively intellectual environment. At World School, students love to learn and collaborate with their peers and teachers as they explore into new topics together. Through intensive training, collaboration and dedication, our teachers prepare their students for life in this millennium by designing instructional strategies that foster the development of the unknown Century Skills. A challenging curriculum is offered to ensure that each child reaches his or her full potential to the greatest degree possible. At World School, we also cultivate a culture of reading, thinking and reflecting, which keeps our knowledge-seekers alive and encourages life-long learning. Each child is respected for his or her unique set of competencies. Students are directed to an understanding of their own strengths, potential and dynamism. Let Your Child Be The Winner In Life..